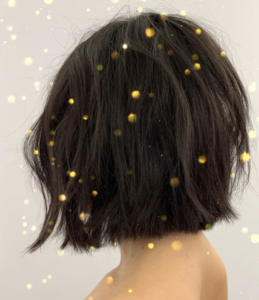 This feminine and airy ear-grazing soft undercut bob is a fresh take on a classic style. The point cut blunt baseline softens the edges, while subtle layers throughout add dimension, texture and volume to a seemingly one-length style. Styled with a very gentle Lived In and Nu Wave variation technique, Anh combs through the waves to soften the look and finishes off the style with L’Oreal Professionnel DePolish to define the ends and a spritz of Next Day Hair all over for undone texture.